Metamorphosing Leopard Frog (Rana pipiens) photographed in Livingston County, Michigan. 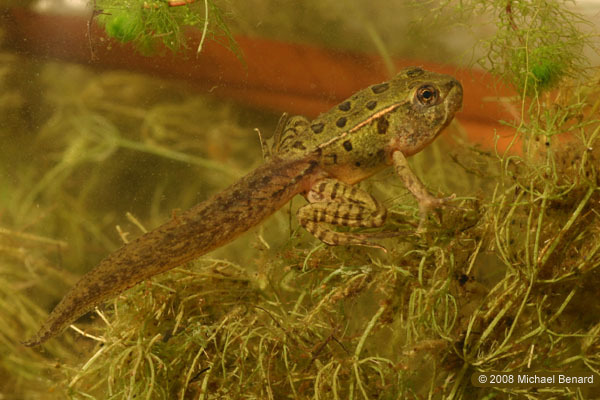 While undergoing metamorphosis, frogs are intermediate in morphology between the fast-swimming tadpole and the jumping frog. The intermediate form has particularly poor swimming and jumping abilities, making them especially vulnerable to predators such as garter snakes. However, if the young froglets are able to avoid predators, get enough food, and survive other obstacles, it will grown into an adult leopard frog.